I’m in two minds about this book, so I’ll get the negative out of the way first. The writing was not my favorite, and the characterization of the teens seemed really stereotypical/cliched, particularly in the beginning. The plot meandered a lot, so that we were led down five or six different possible paranormal routes. It didn’t feel like bait and switch so much as abandoned ideas. With all this together, the book felt more like a first draft than a finished piece. And of course, it’s the first book of a series, which nearly always falls into the negative for me. There is no closure. The story cuts off right in the middle. But now I want to talk about the good things. Despite the shaky characterization, I really loved some of the characters – Mara, Noah, Daniel, Jamie. Noah, of course, was incredible, and I don’t even mind that he was designed to be the perfect love interest. Despite the writing not being my favorite, the scene creation was fantastic, pulling on all the right strings to tug emotion out of the reader, so that I got attached to the characters and story despite the writing. That’s difficult for me to do – I’m usually so focused on the writing that if I don’t enjoy it, I can’t connect with the characters or enjoy the plot – but this book did it. I read the entire thing in a single afternoon, neglecting other things I meant to do, because it was just that good. I can definitely see myself reading the sequel when it comes out. I’m really interested to see where Hodkin is going. I must say, though, as a random sidenote: It would be great to read a book where all the paranormal-like activity really DOES turn out to be something psychological rather than paranormal. 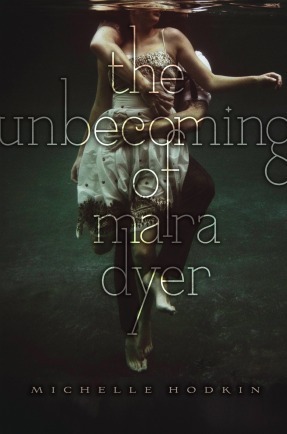 Mara is diagnosed with PTSD early in the book, and I would have loved for the book to close as a single entity, and for the things happening around her to really be a psychological problem. That would have been fascinating. Not that I mind this book going the direction it eventually went, but I still would have rather enjoyed the less-traveled road. Note: Reread in Dec 2012. This entry was posted in 2011, 2012, Prose, Young Adult and tagged multi-read, psychology, reread, speculative. Bookmark the permalink.